I know this may be a silly question but does the A-rig sail for the RS300 use the same mast as the B-rig sail?? no they are different masts. Originally I understand the A rig mast was softer to allow it to depower, but later they just cut down the B rig mast and put the gooseneck in to suit! (presumably cos the A rig doesn't point, and a stiffer mast should hold the leach tension a bit better) You can hoist an A sail on a B mast, but you end up with a bit of bare mast sticking up, and I don't think it would be class legal. Incidentally, the top sections can be swapped, subject to the angle of the cut where they join. Alternatively, the B rig can be reefed, and ends up the same size (ish) as the A. Originally I understand the A rig mast was softer to allow it to depower, but later they just cut down the B rig mast and put the gooseneck in to suit! . I dont actualy own a 300 im afriad (certainly wouldnt say no), im asking for a friend who although i really do believe could handle the B-rig (she's better than she'll admit) would be much better suited to the A-rig due to her size. Problem being that she loves the look of the 300 but one with an A-rig on the 2nd hand market seems to be a bit of a rarity. 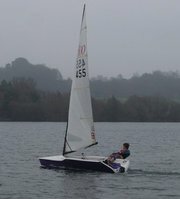 And shelling out £800 on another mast aswell as having to buy the A-sail doesnt really inspire. Its a shame really because i personally believe the 300 to be a BRILLIANTLY designed boat!! Once you are used to the rig, it is very easy to de-power, and the B rig is almost certainly better. A rig boats do come up from time to time however, and I got my rig 2nd hand from LDC pretty cheap. Personally, I think the 300 has one of the best one design singlehander rigs ever made. Sadly, they probably made the boat a bit too demanding for that market: people don't expect to spend that much time learning a non trapeze boat. If it had a trapeze or an assy, no-one would be suprised that it needs a season to learn it, but people seem to expect to be able to jump straight into the 300, and unless you have appropriate experience, you can't! Take the time to learn a few simple techniques, and it ain't that hard, and the rewards are......well worth it!! How much would it cost to get a B rig and sail do you guys think? Bryn, the mast is not cheap fella, the sails are about £500, the mast just shy of a grand, unfortunately you have to buy both sections. I would suggest you look for a boat with the B-rig already. Not that there is much bloody difference between the two.